The forecast was suggesting low cloud with very little thermal possibility. The forecast wind of 9 knots from just south of east raised the possibility of some wave but the atmospheric sounding did not support this idea; there was no inversion. Arriving at the airfield it was immediately obvious that there was something wrong with the forecast, at least locally. Brentor sat in the middle of a large blue hole. To the east, over Dartmoor, sat a roll cloud on the hilltops. So there is some wave after all. A closer inspection of the sky revealed little clouds forming in the wave rotors. Could be a rough ride then. 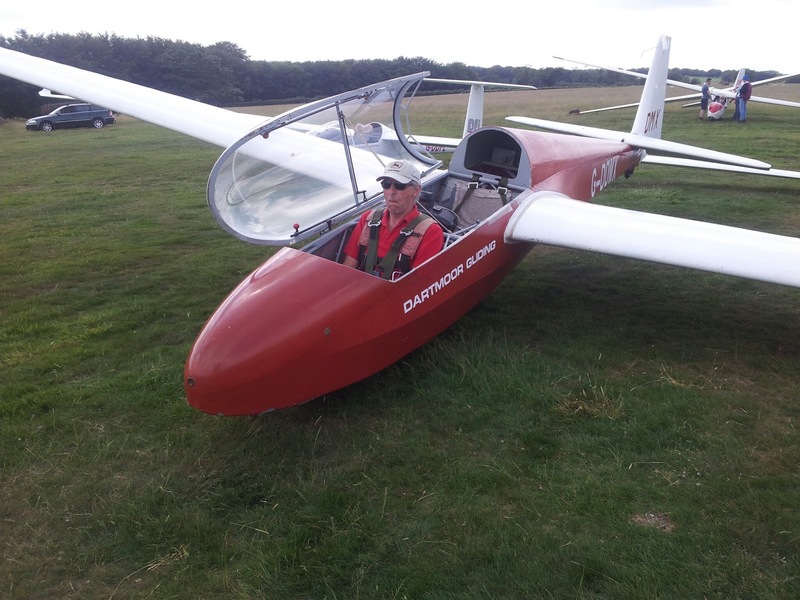 Today’s instructor, Ged Nevisky, arrived to authorise the airfield but he was unable to fly as he had injured his back. I was already planning to fly the air experience visitors so added the club trainees to my list so that everyone could fly, although I would have to do all the take offs and landings. This is one of the limitations of an Air Experience Instructor. There first flight revealed very rough flying conditions. After 15 minutes bouncing around in the rotor turbulence. In these conditions the final approach can be challenging but it was only mildly so today. By the second flight things had changing as the air became thermic breaking up the wave as it tried to form. A the day went on conditions calmed down somewhat. Some of the thermals were astonishing. Although very narrow and broken, reports of 6 knots were not uncommon. This was obviously wave enhanced. What do you do while floating around in the top of a wave system for 4 hours. 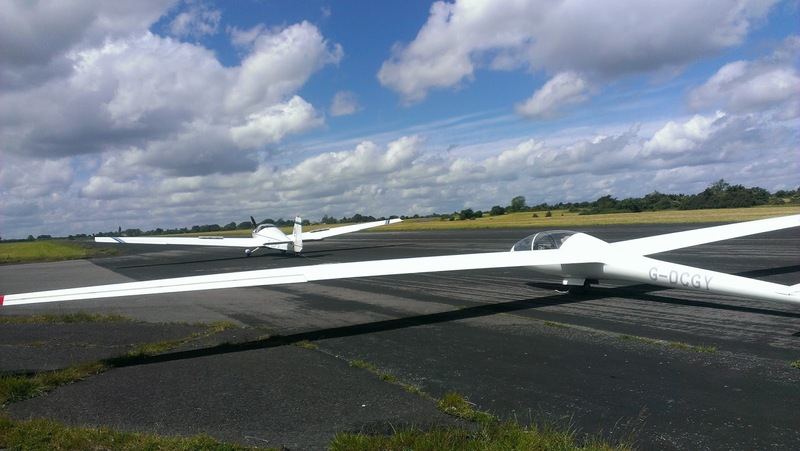 There was a good turn out of private gliders with the Open Cirrus, Jantar1, ASW20, K8 and 2 Astirs all making an appearance. Most pilots managed soaring flights. 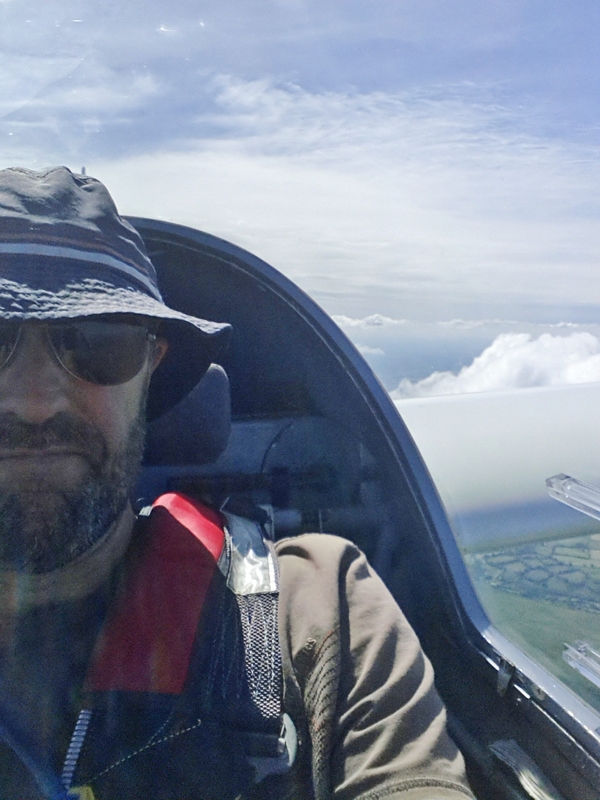 The best flight of the day was 4 hours and 2 minutes by Mike Gadd in the Open Cirrus who used thermals to climb into the wave above. 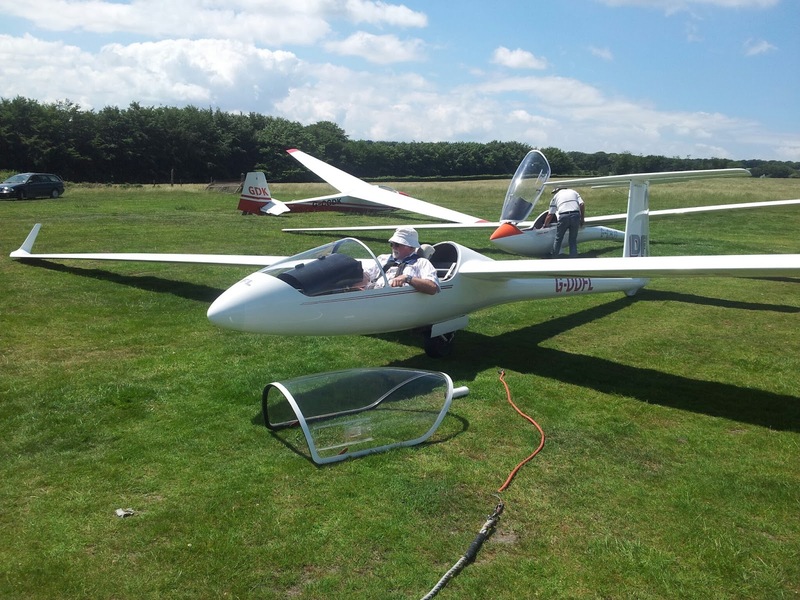 Highest flight today was by Trevor Taylor in the Jantar1 who managed 4700 feet above the airfield in the wave in a flight lasting just short of 2 hours. 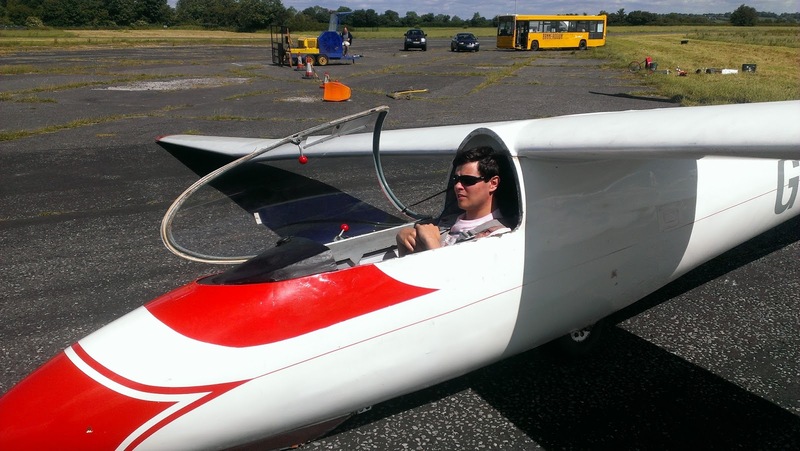 Club trainee pilot Jorg Beasley waiting to go soaring. 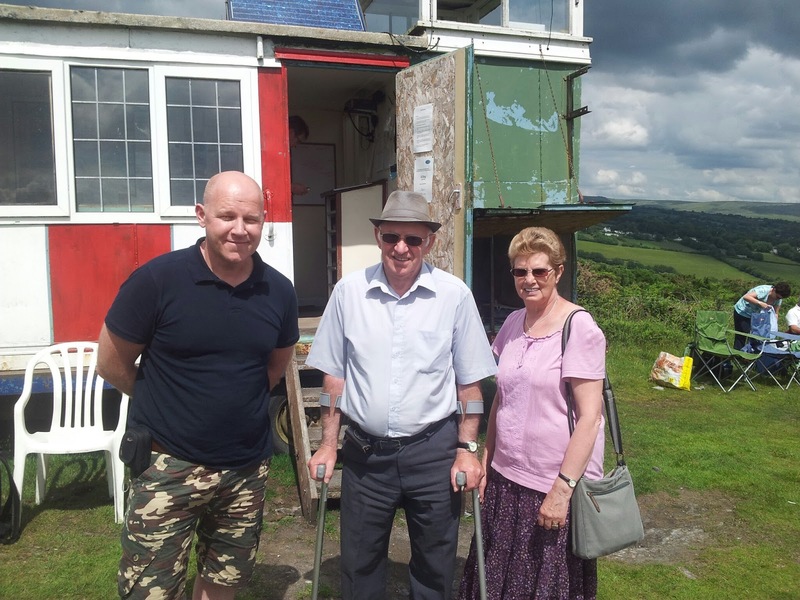 Today’s visitors were Brian Carfey and Ian Osbourne. Both had soaring flights. 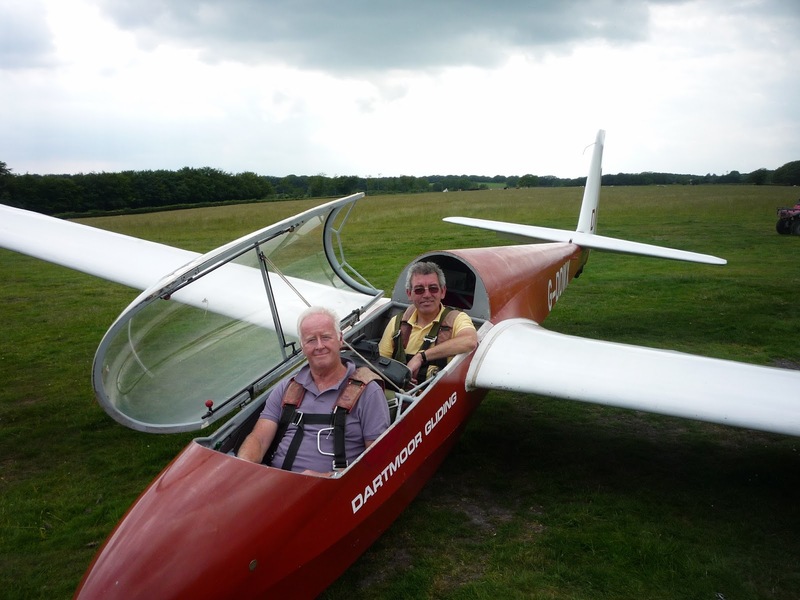 We will be definitely seeing more of Ian, an ex 747 pilot who is planning to take up gliding. 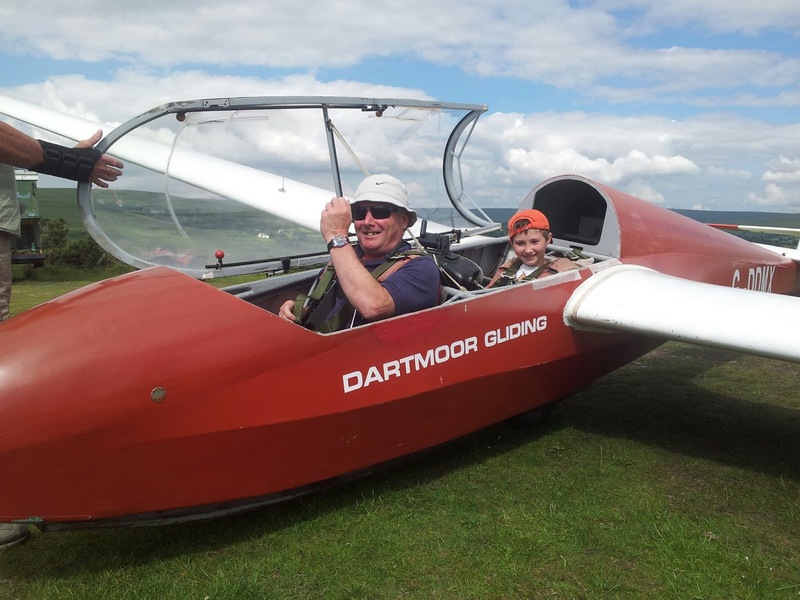 Several of the club trainee pilots also managed soaring flights. A great day in interesting conditions. Well if it wasn't the 'day of days', it was certainly a day that 'ticked all the boxes' for those who came to fly. Of which more later. But before that it must be said that today was the first Sunday on which it was possible to create a winch roster of 4 or more drivers, each driver spending only 2 hours apiece at the winch, and managing their flying objectives against those of others trying to the air. But what of the day? Well, if you look at the stats for the solo pilots: Dave Parker K6 1:36; Martin Broadway ASW20 1:30; Jerry Wellington K8 1:07; Roger Applebeezer K6 0:32 and Jeff Cragg 0:30 the 'usual suspects' had a good day (Jeff Cragg's c.half hour having been completed before 1130). 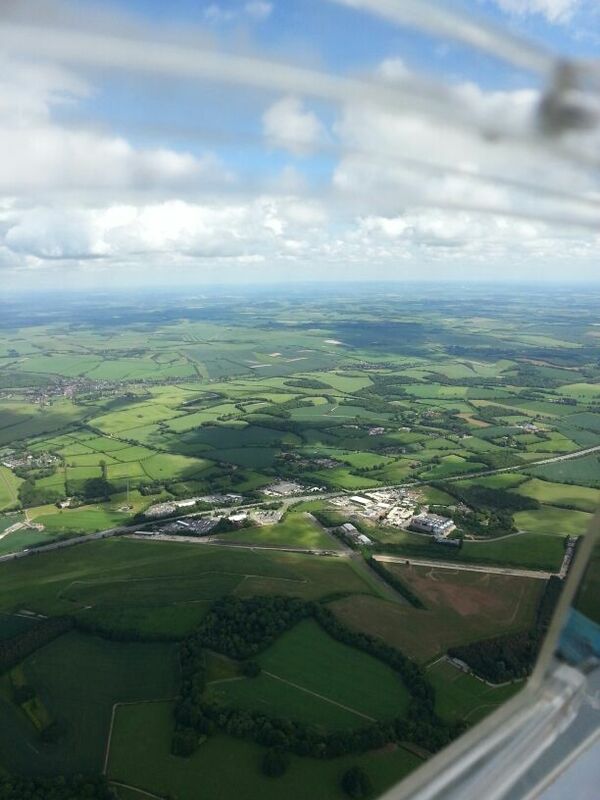 Jerry's veiw of the airfield from the K8 from the south. 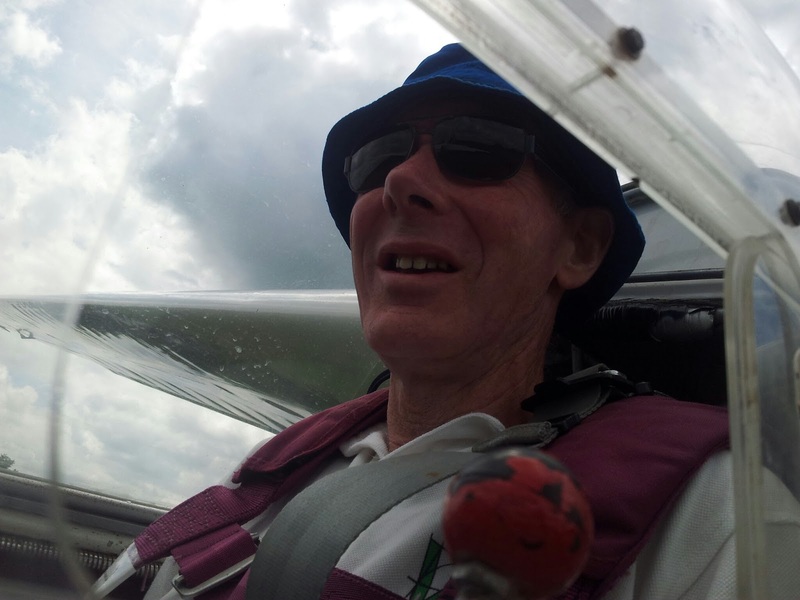 On the training side, the light easterly wind allowed uncomplicated launching, driftless soaring and turbulence free approaches that were very confidence building, particularly for New member Kit Smith. 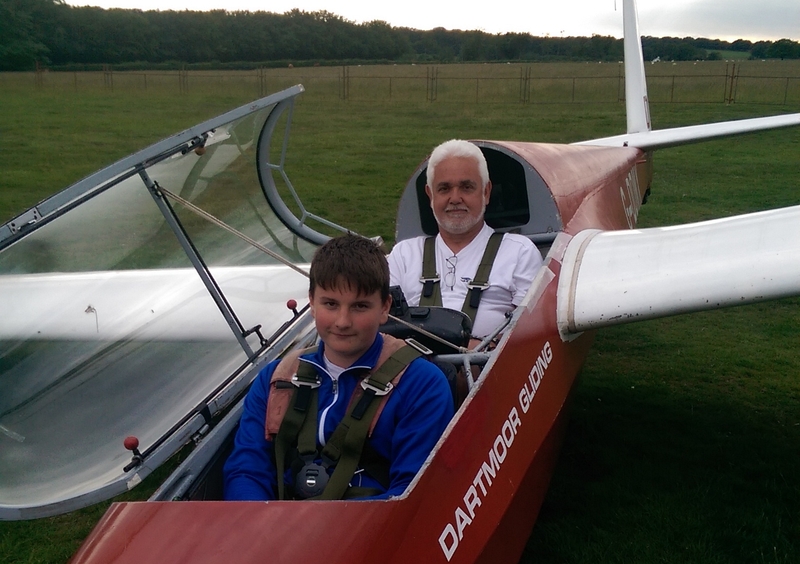 The nicely buoyant air mass also allowed trainees Adrian Irwin and new Junior Member Elliot Acton to experience soaring flights to 3,000ft (Adrian's all his own work), whilst 'Trial Lesson' student Chris Owen, whose escape tunnel has taken a meandering route from Southdown to DGS. 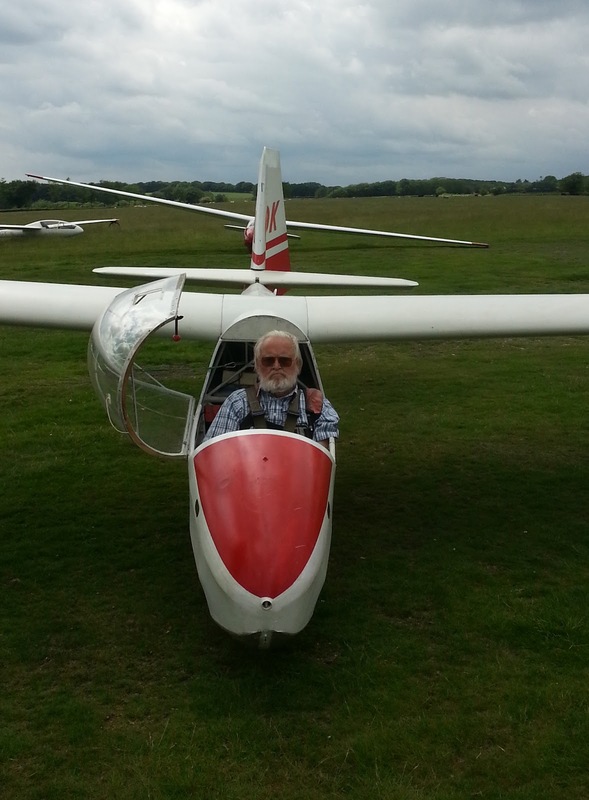 was able to experience gliding for the first time in 35 years. 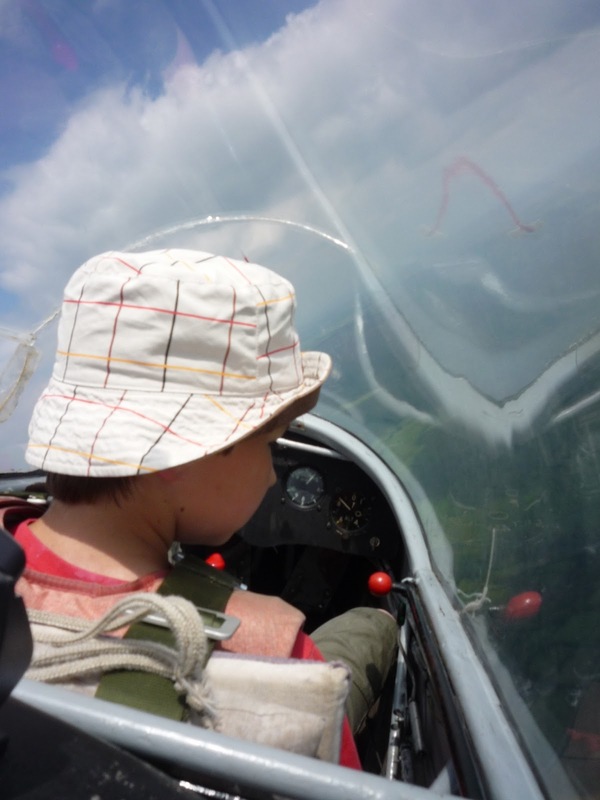 In addition, Trial Lesson student Katie Barne (pictured) enjoyed a 20 minute 'early morning' flight to 2,000ft over Blackdown before the solo pilots even got air between grass and skid. As the afternoon progressed the light wind allowed a convergence to set up, to the west of the site and most strangely aligned N-S. 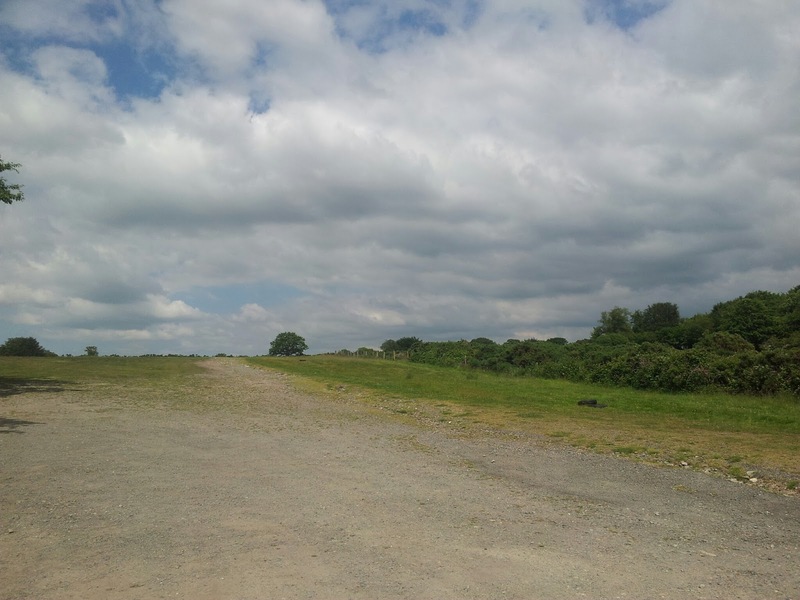 Unfortunately there wasn't time to explore this, but Tony Deane also reported a N-S energy line to the east of the airfield. As I landed a little after 5pm a quick straw poll revealed that all those who wanted to had flown, which was much to my relief since the surface wind had by then swung around to nearly west, implying a downwind launch which, however light the wind's strength, would not be recommended. Thus we all set to with a will to pack the kit away, some of us even volunteering to help the private owners to de-rig. Today was intended as a club flying day with pilots self certifying ie there was no instructor in charge today. In the event although there were enough members to fly it was decided to make this a non flying day to move the club maintenance projects forward. A bit of a shame as the day looked really good. The highlight of the day was the independent arrival of two club founder members Shell Ericsson and Colin Saunders. A couple of very pleasant hours were passed with these old timers regaling us with stories from the clubs past. DGS News on a Friday? I hear you ask. Well yes. 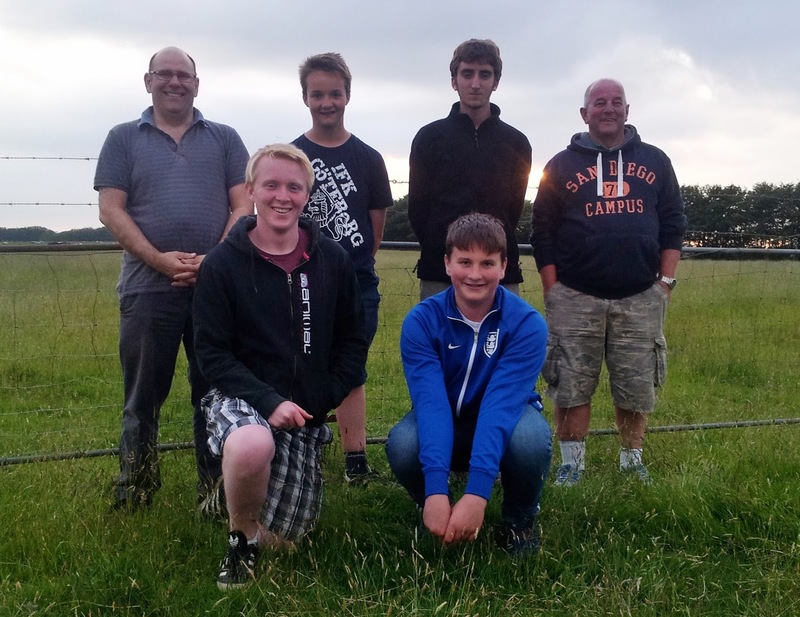 We had an evening visit from a Scout group from Torpoint. Leaving Plymouth in bright sunshine I was looking forward to an evening of flying in sunny, perhaps thermic, conditions but approaching the airfield it was obviously going to be a little different. 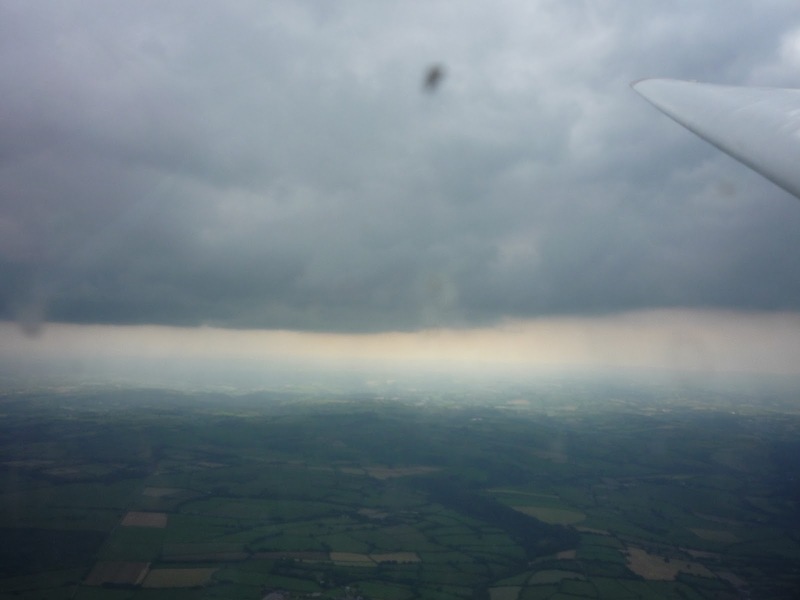 There was a large area of dark grey cloud covering the whole of Dartmoor. However, there was almost no wind in the very quiet conditions. 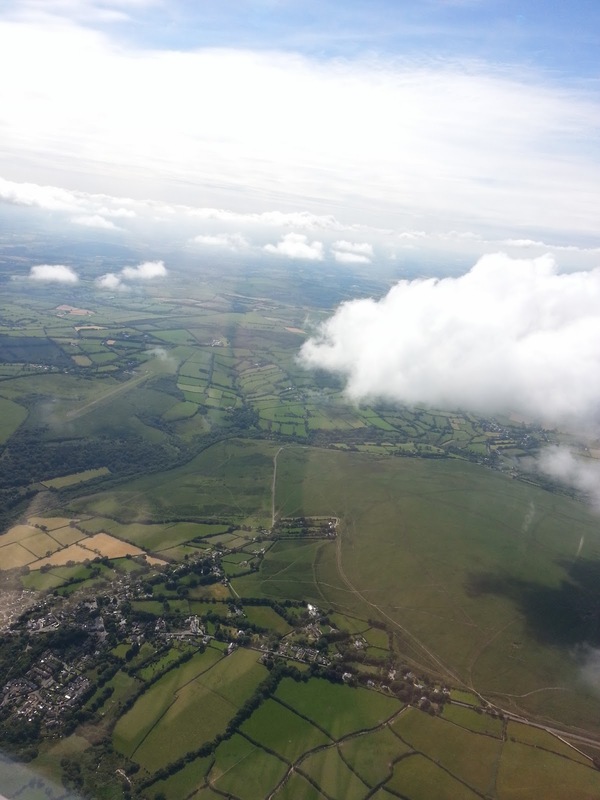 We flew from the west end and were able to take advantage of the fact that we were only operating one 2 seater in the still conditions to land “downwind” i.e. over the winch stopping alongside the the launchpoint after taking advantage of the little amount of rising air over the eastern slopes. Each of our visitors, 4 scouts and their leader completed 2 flights and the briefings and lectures necessary for their gliding badges. Well done everyone. The high pressure continues giving us very pleasant flying conditions. The wind today was NNE 5 knots and with the long periods of sunshine it was warm for the whole day. The day started and finished with a bit of exercise as the hurdle fence was removed ( and later replaced ) from the west end approach. 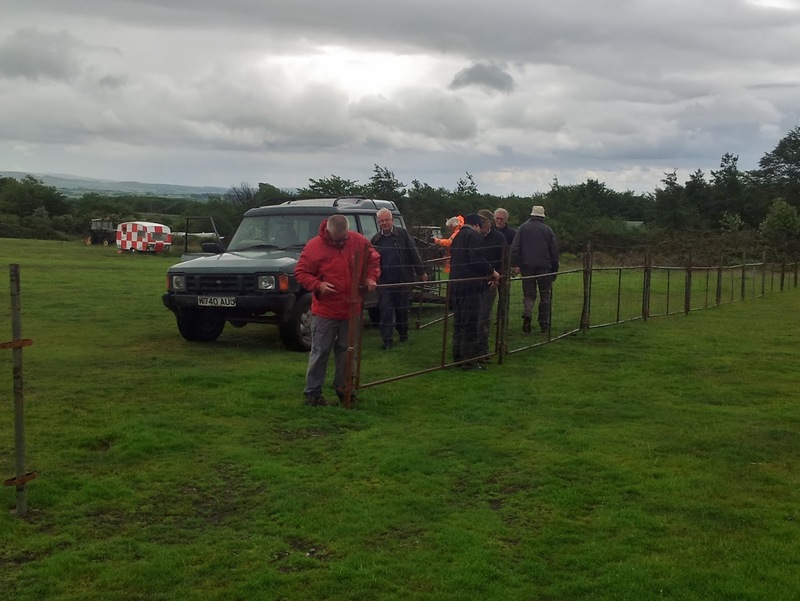 The fence is necessary at the moment as there are cattle in the West End undershoot field. With our usual Wednesday instructor Bob Pirie away on holiday, instructor duties were fielded by Ged Nevisky. 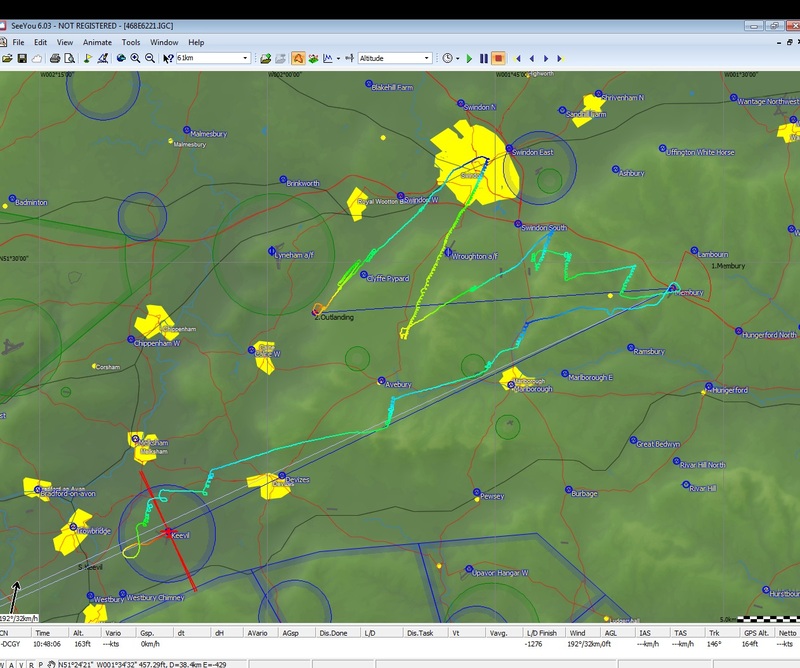 Ged was kept busy all day with a mix of check flights, and lessons for our trainees. 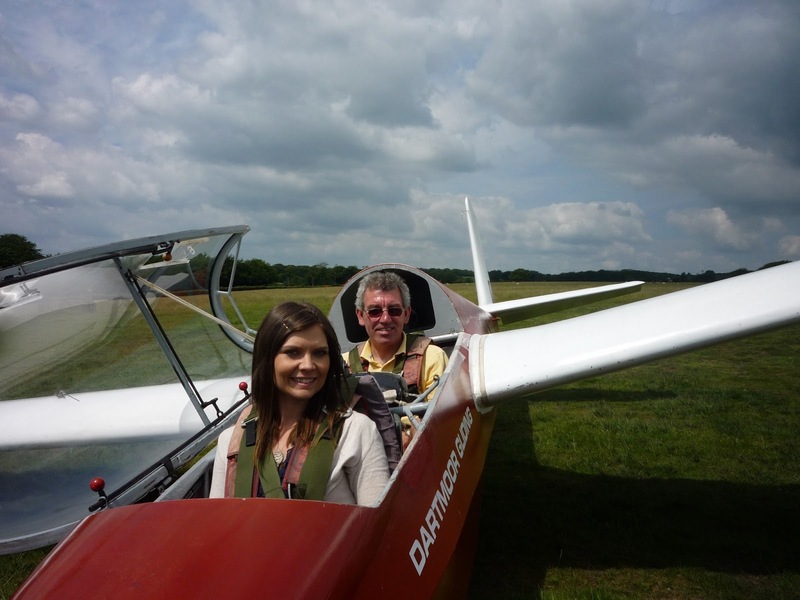 Several of our trainee pilots were lucky enough to get soaring flights. 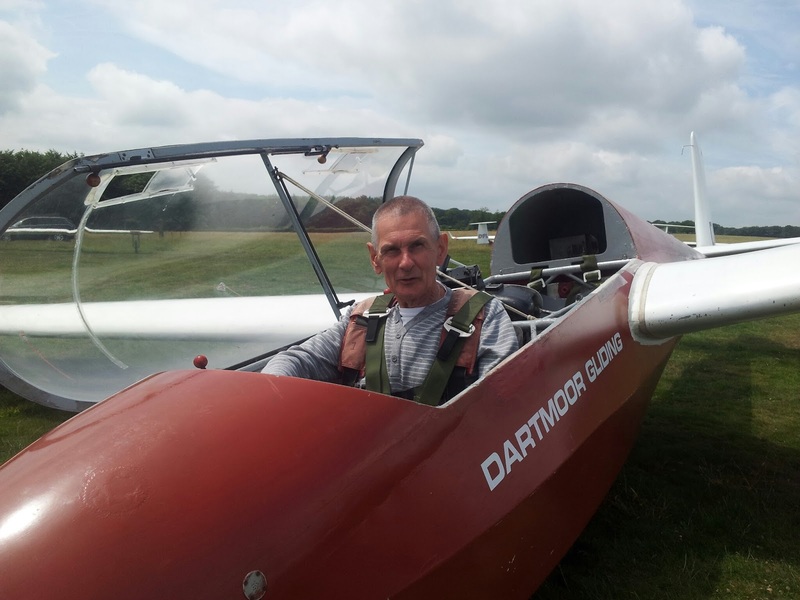 After successful trial flights, verteran pilot Jeff Craggs re-soloed in the K8. There were a lot of private aircraft out today. These included the Jantar1, Asw20, Astir, K6 and K8. Most of the privateers managed at least 1 soaring flight, some more. Best flight of the day was Trevor Taylor in the Jantar1 who returned to the airfield 2 hours and 34 minutes later after very nearly landing out at Folly Gate. Our thanks go to the usual suspects. 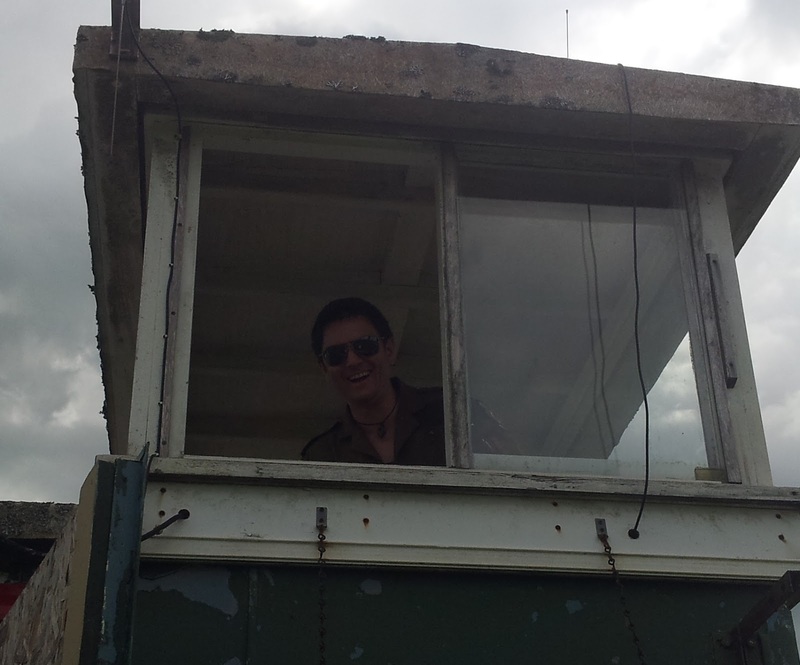 It was nice to see John Rogers putting himself forward to train on the winch and Jorg Beasley to train in the control tower. The high pressure continues. Today was very pleasant with light northerly wind, lots of sunshine and warm conditions. The downside of this weather is that it has encouraged a display of white legs and knees as members reach for their shorts for the first time in 364 days. Maybe we should give a prize for the most offensive knees. CFI Don Puttock was duty instructor today. He started the day with Leith Wittington’s General Flying test. There followed dizzying mix of club and visitor flying with both Don and myself as we tried to maximise the use of the K13. 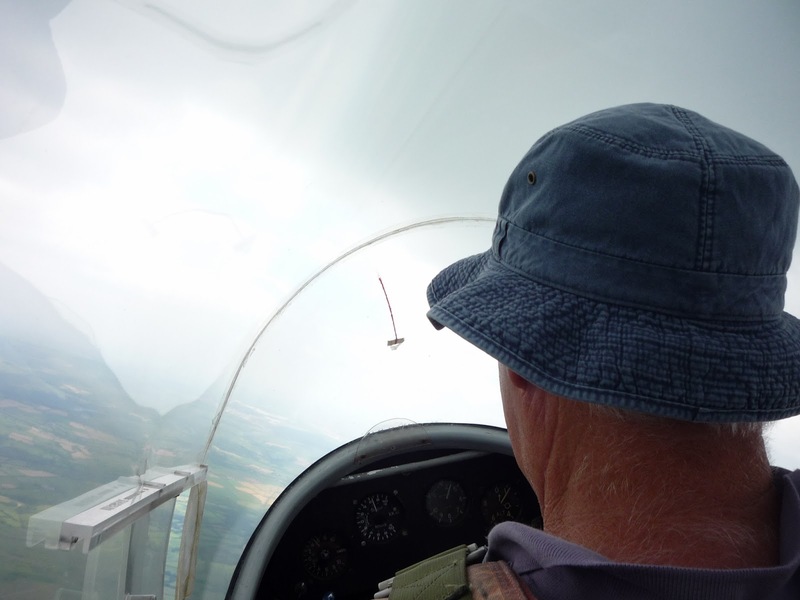 In between there was soaring by the solo pilots in the Astir, K6 and Zugvogel. 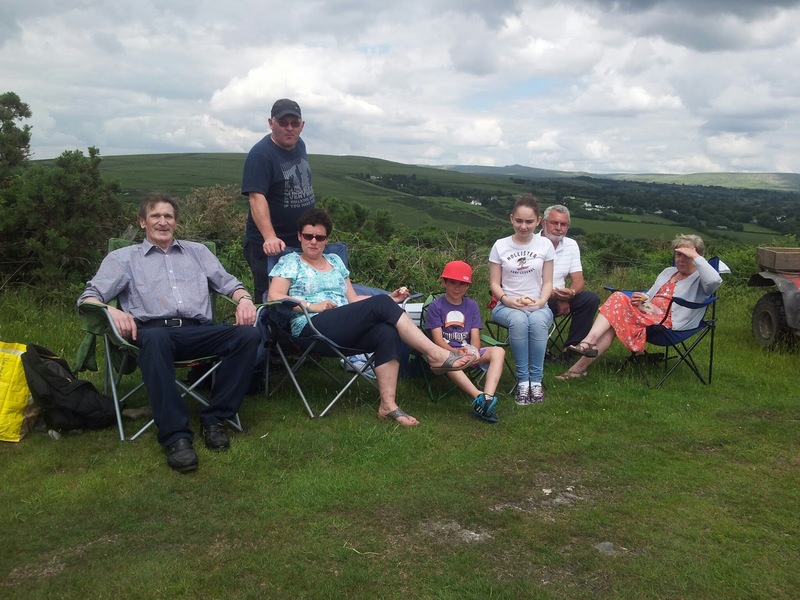 It was a day for family groups. 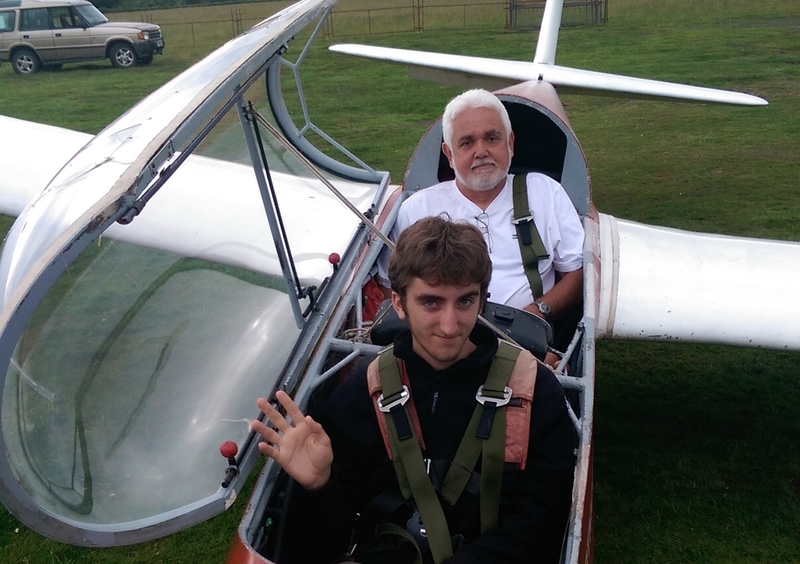 Elliot Acton flew from the back seat with CFI Don. Soaring conditions were never easy but remained interesting throughout the day. The North ridge was certainly playing it’s part giving both ridge lift and encouraging thermals. At times the lift was in very narrow straight lines; wave? an idea supported by the occasional large areas of sinking air. At other times there were larges areas of gentle lift; convergence?. Whatever the cause the soaring was both challenging and enjoyable. Today would not have been possible without the sacrifice of Ged Nevisky. He drove the winch all day to allow us to concentrate on the flying. Many thanks Ged. Having driven through low cloud and rain on my way in from North Cornwall, it was a relief to find Brentor 'as forecast' enjoying a pleasant summer's day, with some productive cumulus developing. With light wind conditions, our original intention had been to move the winch into the top field. However, the prospect of incursions into our space by both cows and sheep convinced us that it would be better to leave the fence up and the winch in its usual spot. On such occasions as this, it is important that all pilots be reminded to 'think fence - and think livestock beyond' when considering their launch failure options. Over the last couple of years, many of our solo pilots have become private owners, and today we had about seven private 'pride and joys' being flown, fettled, tinkered with and caressed by their proud owners. 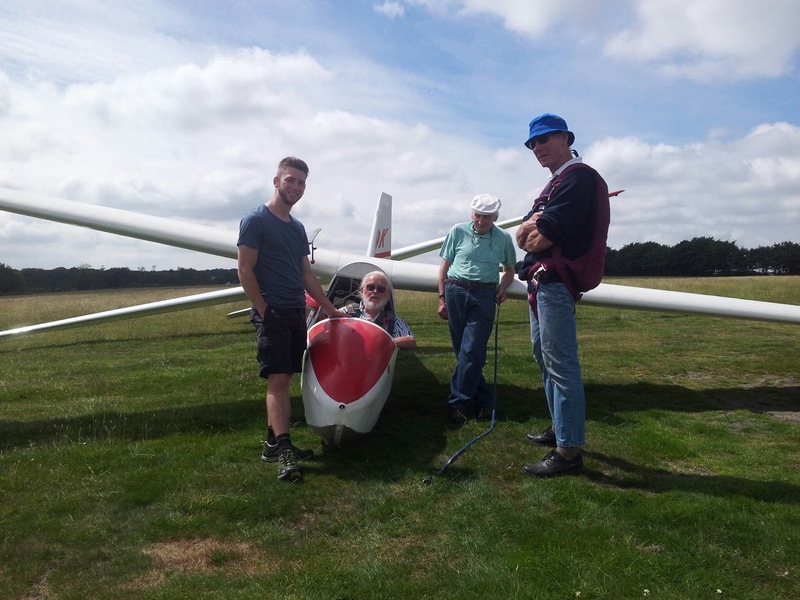 This, combined with a current lack solo pilots interested in flying club gliders, meant that a particularly heavy workload fell upon 'the few', including some of our relatively inexperienced - but enthusiastic - new members. 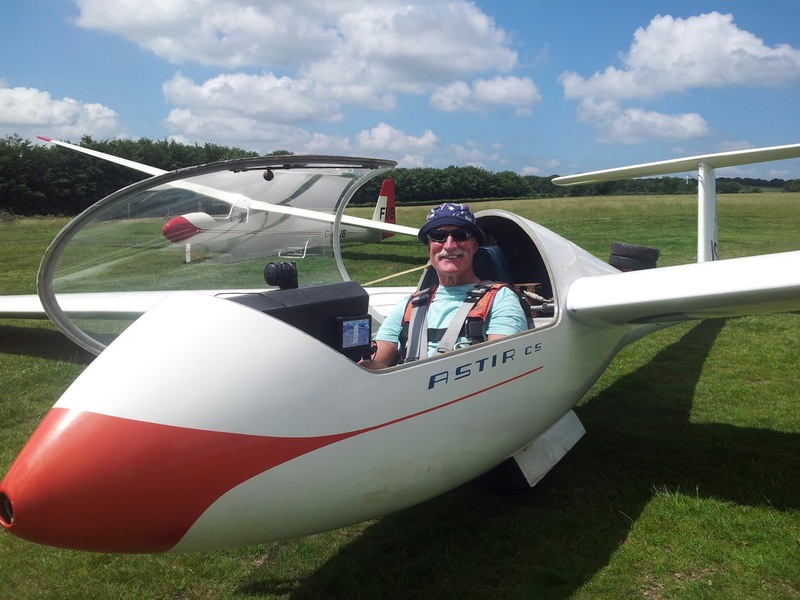 With one trial lesson scheduled initially... then three... then several flights with early ab initio trainees, Steve Lewis really worked his socks off. Meanwhile apart from few training flights, I spent most of the time running things on the ground - while also sneaking off for a quiet half hour in the ASW. As so often happens, the day was good in parts, with many people achieving flights of an hour or more, while others just seemed to get their timing wrong. Today we achieved 36 launches - with most of them to a decent height, despite not having the extra length provided by the top field. As ever, thank are due to several people. Firstly Phil Hardwick for getting the winching going, followed by Steve Raine and then John Howe who both worked tremendously hard winch driving, assisted by trainee John Rogers. John became so engrossed that he missed out on his own flying. Jorg Beasley was glued to cable retrieve duties till mid-afternoon, followed by Bob Sansom. 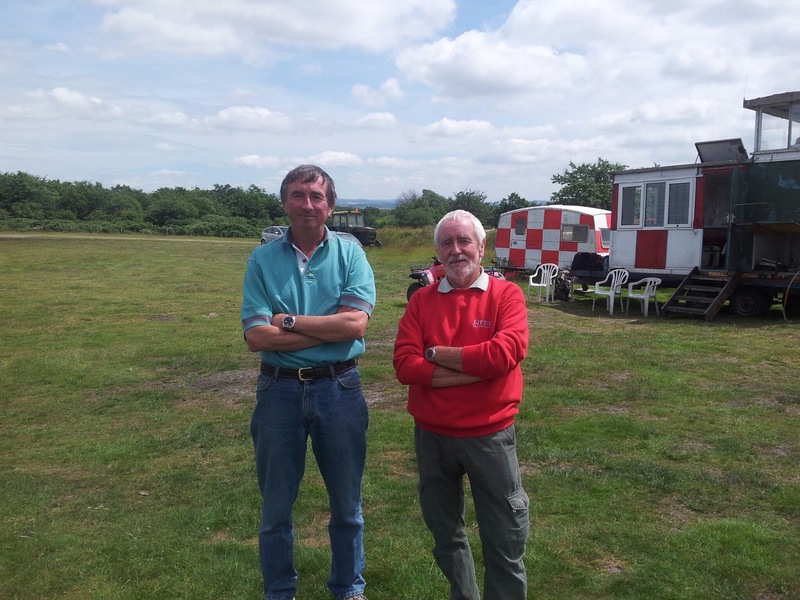 Today - and recent Wednesdays - just would not have happened without the dedication of newcomers like Chris Jones, who is proving to be a competent control tower operator, and Peter Lillywhite and Tom Mitchell, who seemed to be everywhere at once, pushing and pulling, handling cables, running wings - and remaining cheerful. 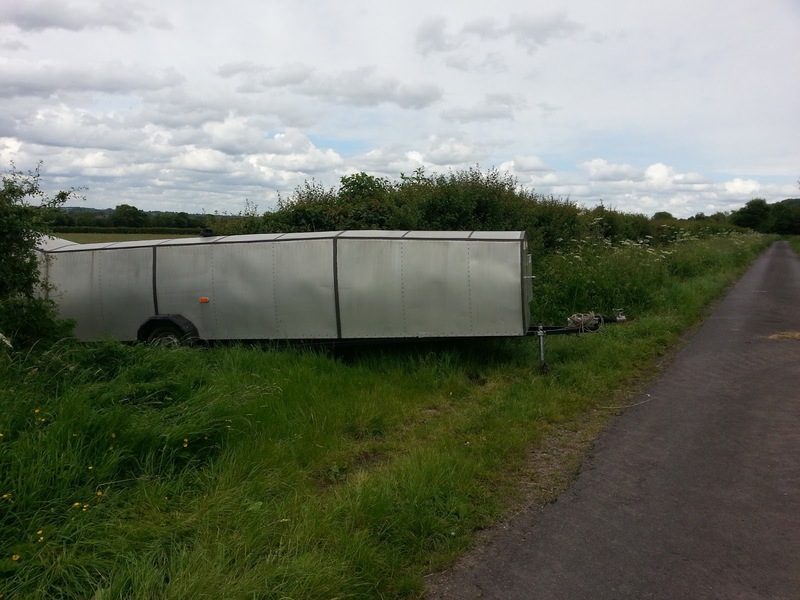 Also, a big thank you to whoever repaired the cable retrieve trailer. It started the day with a puncture and a sheered wheel bolt, but appeared to have been returned to good health by the evening. After a very uncertain forecast during the week, on Thursday, Bannerdown made the call to hold the event. For this event Dartmoor had Matt Wiles (Novice class), Ged Nevisky (Intermediate Class), Mike Gadd (Novice class) and Rick Wiles and Ray Swinfield as crew. 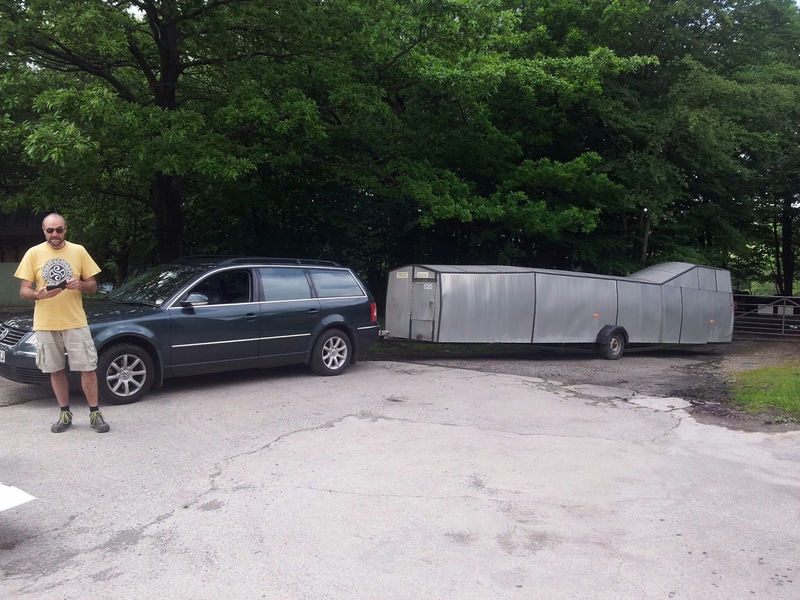 Ged and myself made it to Keevil Friday evening, and after a delay due to trailer electrics on the tow vehicle, Ray, Matt and Rick arrived Sat PM. 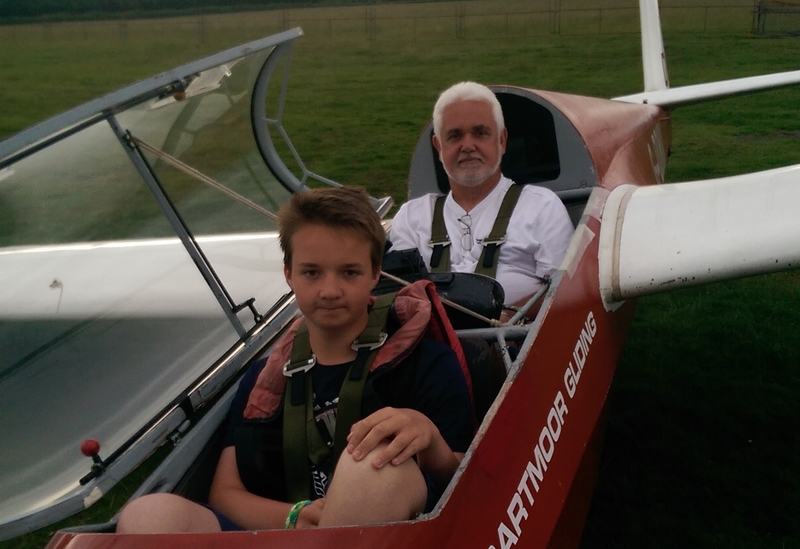 Since Ged and I were sharing the cirrus, we agreed that Ged would fly on Sunday, and I would fly Sat after the rain of Friday night has passed through. 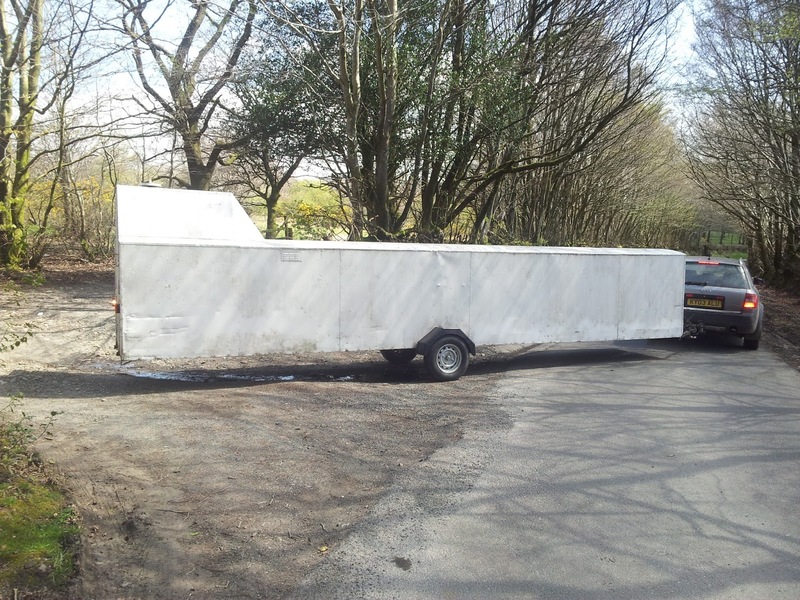 The next problem was that I soon found out that access was not good for trailers, so when Ged arrived we could not get the trailer into the airstrip (who would have thought that an airstrip would not have good access!). Next option was for Ged to take an aero-tow out of the field since tug retrieves were on offer from Keevil (I’m not endorsed for aerotow). 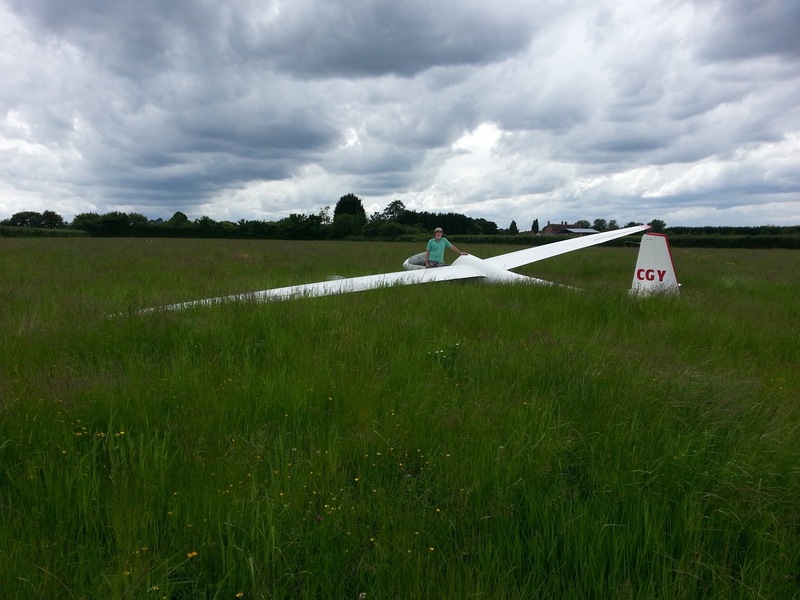 However the tug pilot was not happy that he could get the motor Falke tug out of this 700m grass strip. 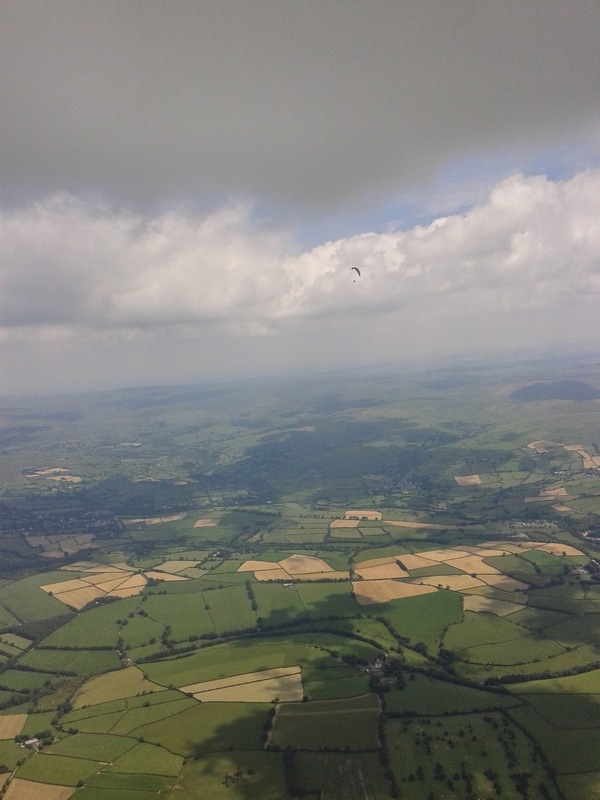 So the only option left was to request help from the local light aircraft pilot, who I met when I landed, to get help from the local farmer to borrow a tractor to tow the trailer across the fields into the strip; De-rig the glider, then a tow back out to hook to the car to get back to Keevil for the (as it turned out very lively) social in the evening, put on by Bannerdown club. 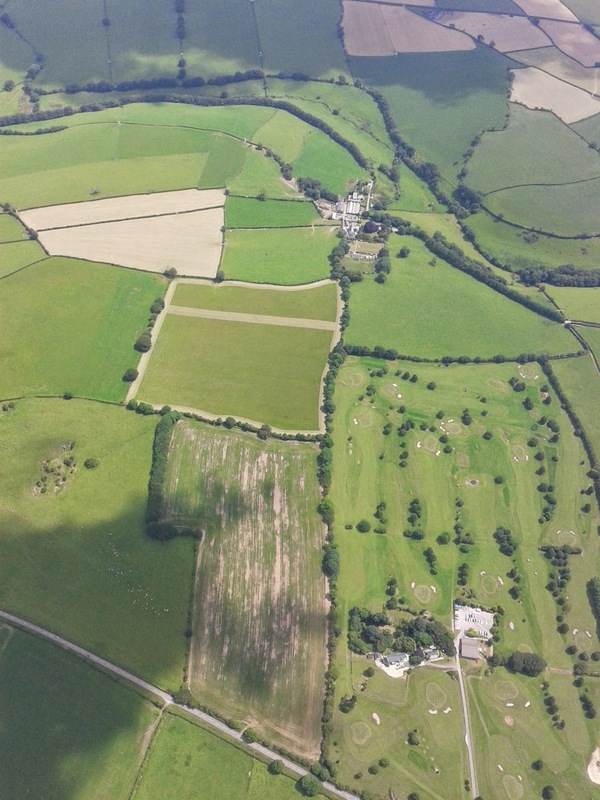 Sunday was Ged’s turn flying intermediate task of 177km, Keevil, Membury, Glastonbury, Keevil. 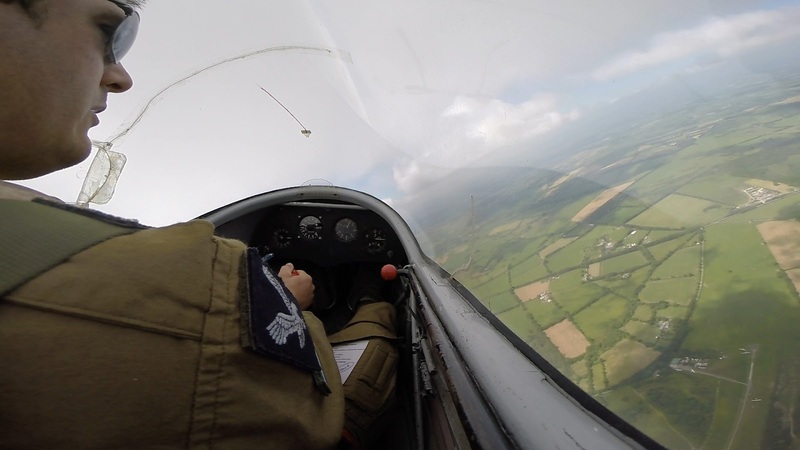 The sky looked promising, but the wind was always to be an issue today, and after making the first turnpoint at Membury, he like many was not able to push into the strong winds and ended up landing out. So day 2 was a second retrieve for the open cirrus. Our novice entry today was Matt Wiles in the club Pirat and there were high hopes that today could present an option for a silver 50KM which Matt is chasing. 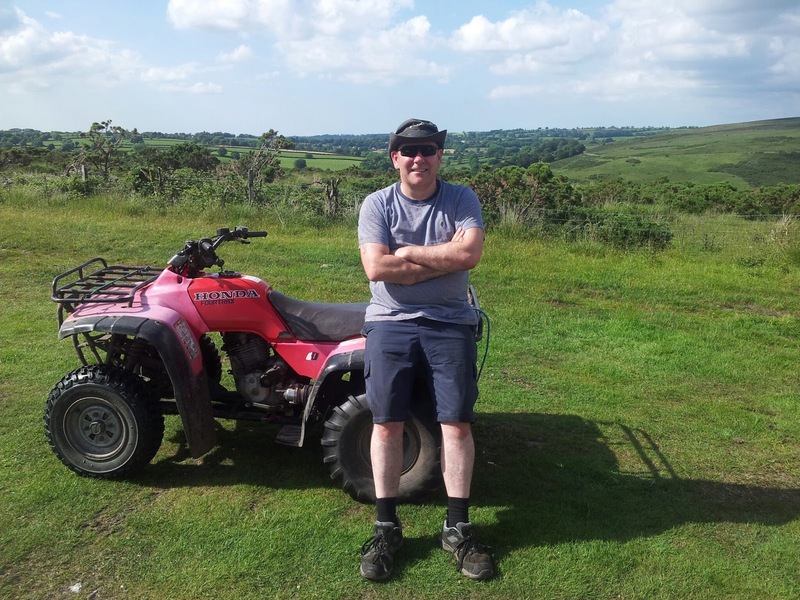 After 2 valiant attempts, Matt finally managed to connect with the tricky conditions that were materialising for the day, and get away only to find that his task GPS had not triggered a proper start. So rather than risk a false start, he returned to cross the start line to try again. However, this time the conditions put him on the ground once more – commiserations Matt, you did well to make the most of the conditions, better luck next time! 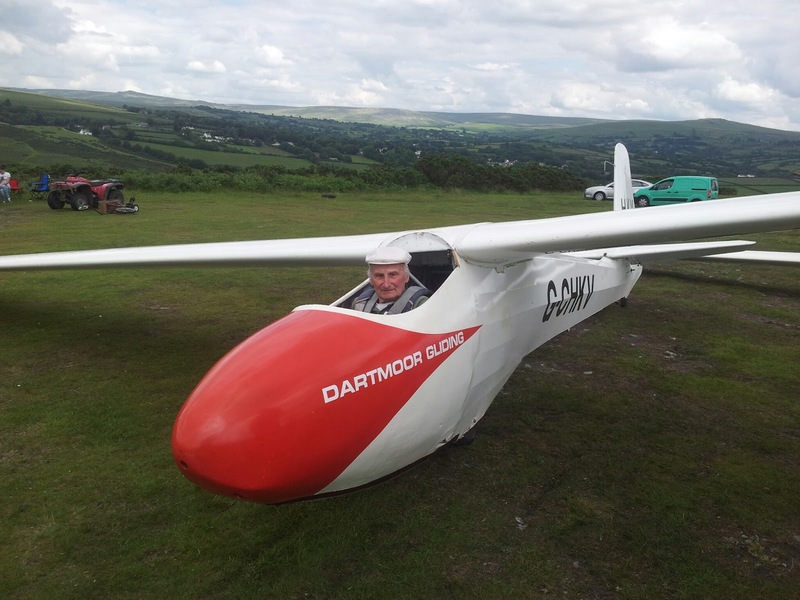 And finally, Dartmoor having being short of a Pundit for Sunday, and Pilot Stewart Renfru (Ventus B) from The Park without a vacant slot, offered to fill the slot and fly for Dartmoor. He also struggled initially, getting a re-light at Keevil, and then making the first turnpont before ending up at Rivar Hill airstrip. A request for a launch from there put him back in the air, but again the conditions put him down again this time at Upavon airstrip. 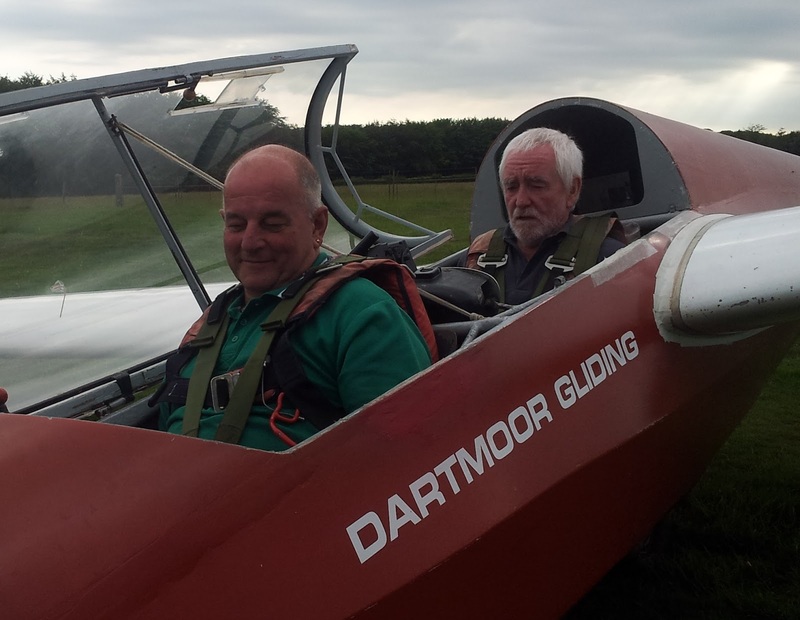 Thanks Stewart for offering to fly for us, however, to fall in line with the spirit of the ICL, scores can only be accepted from members of the competing club, so regrettably, we could not accept any points scored. 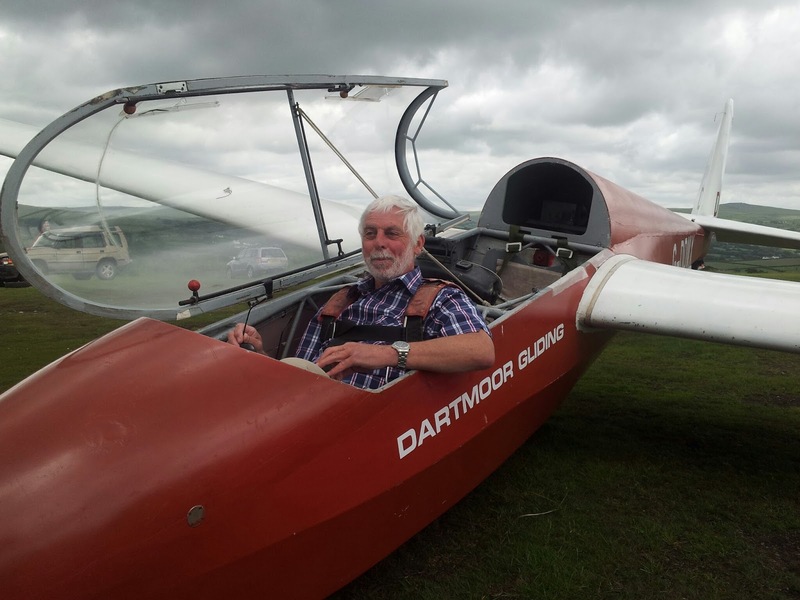 Finally on Sunday after the Cirrus was retrieved from a hay meadow, we all headed home after a full and fun weekend with Bannerdown Gliding at Keevil. Special thanks to Ray Swinfield for pulling the club Pirat and crewing for us. Hopefully next time he will get a chance to fly. I will publish the scores when I have them. Today was always going to be difficult. The weather was not good. Low cloud, heavy showers, and, when the forecast clearance came the conditions would be best described as challenging. 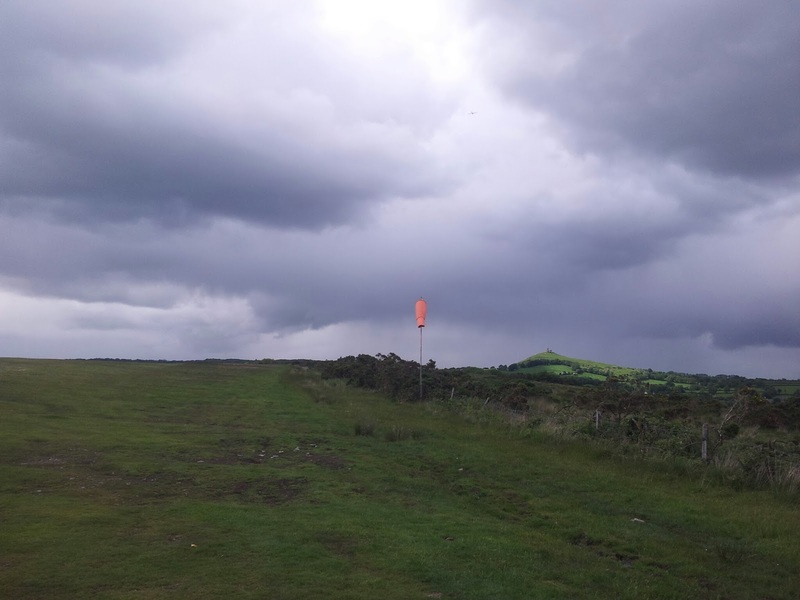 So not really surprising that there was no flying at Brentor today. This does not mean that DGS pilots were not active though. 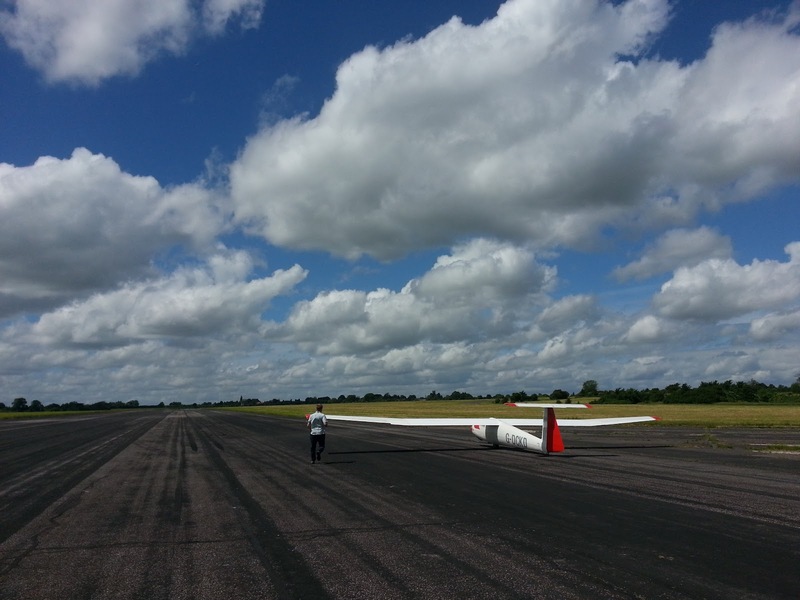 Ged and Mike were away at the Interclub league competition at Keevil with their Open Cirrus. They were joined by Rick and Matt Wiles, Ray Swinfield and the club Pirat. Hopefully we will get a report on their exploits soon. Meanwhile Mike has been posting some photos on the DGS Facebook page. 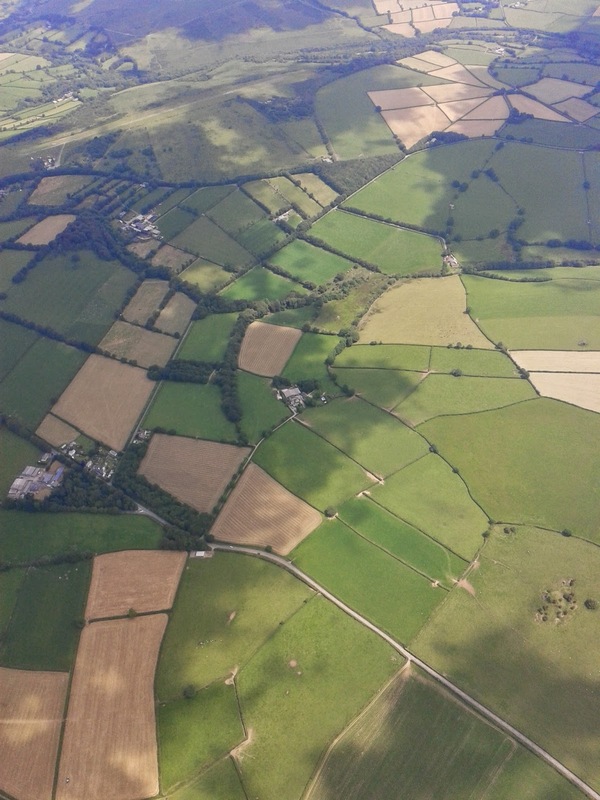 Just to wet our appetites here is one of Mike's pictures from the ICL. At the club, Mike Jardine, Dave Bourchier and Allan Holland were busy with a variety of tasks. The K8 has been reassembled and now requires the duplicate inspections from an inspector before going back into service. 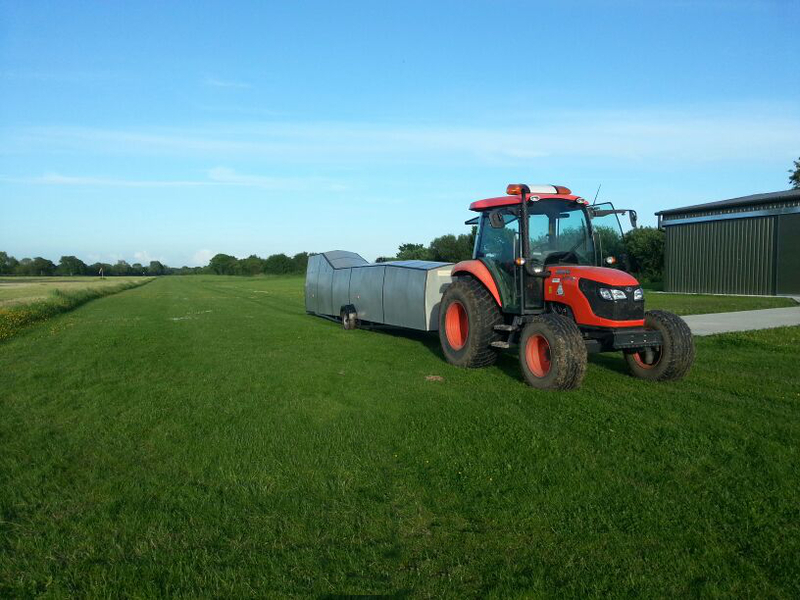 Mike Stacey and his family run the farm adjacent to the airfield and are long term supporters of the club. 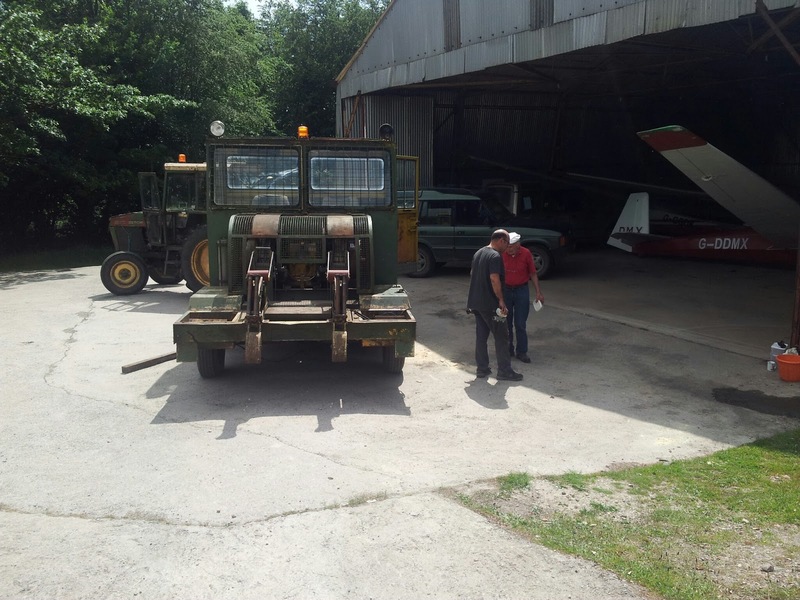 Mike was one of the founder members of DGS and arrived today with a “telehoist” to help move the old winch engine from the hangar to the scrap metal skip. Many thanks Mike, your help is much appreciated. In case you are wondering, a telehoist looks like a very rugged, off road, fork lift. Dartmoor was probably the last part of the SW peninsula to endure the heavy overnight rain. With a sodden airfield, continuing showers and 20 kts + of wind (albeit straight down the runway) for the first half of the day we didn't venture far from the clubhouse and hangar, apart from Steve Raine on mowing duties, Phil Hardwick giving Peter Lillywhite a lesson in setting up the winch, and Vice Chairman Colin Boyd leading the charge to assemble a commercially-viable skip full of scrap metal. With the 70th anniversary of D-day approaching, I delivered a short talk and showed a video of the flypast of 36 gliders and tugs which I was privileged to initiate and lead over Portsmouth Harbour and the Solent to commemorate the 50th anniversary in 1994. Then Ged Nevisky brought us bang up-to-date (and down-to-earth!) by explaining what will be required of all of us (every member, in fact) when the BGA conducts a quality audit of our club later this summer. The big clean up is now underway and if you need some guidance as to how you can help, ask Ged, David Bourchier, John Bolt or Colin Boyd. 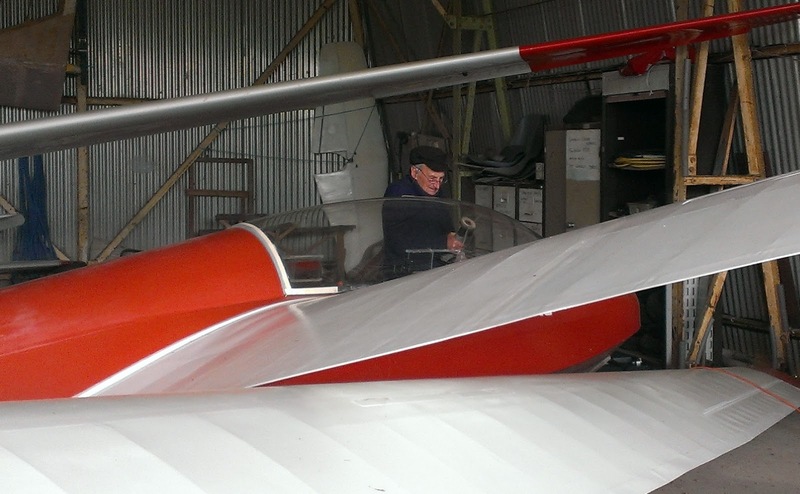 Back in the hangar, having been taken home on Sunday and repaired by Alan Holland, the ailing K13 cockpit canopy was collected, refitted and the glider was ready for action. 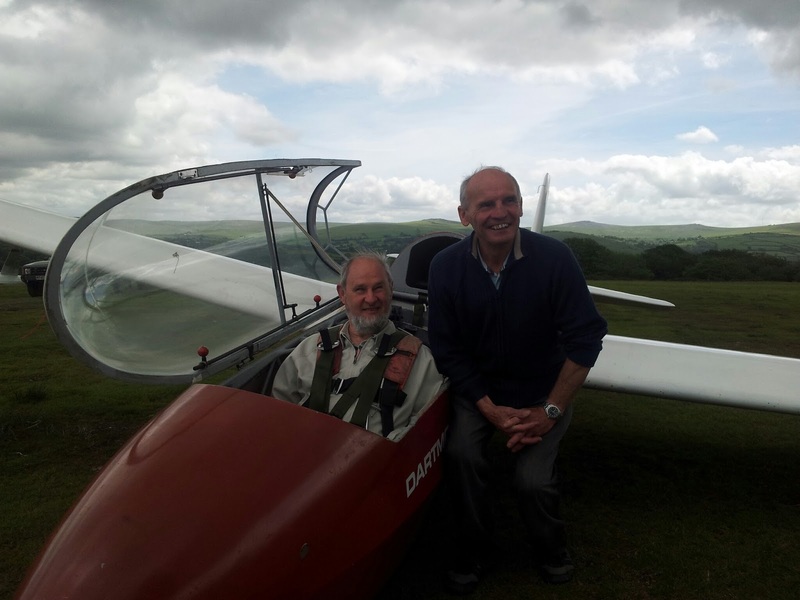 With the sun breaking through and some violent-looking cloud streets starting to form - but the wind still blowing hard - a small group of us made the decision proceed with caution and 'go gliding' - which, after all, is what our club is all about. Ged and I accompanied a small group of enthusiasts who achieved some pretty impressive launches in the K13, in the process encountering strong lift and sink in equal measures, and battling with that strong wind. Everyone coped very well with the challenging conditions, and there was no shame attached to the occasional 'expletives deleted' and cries of 'I have control' from the back seat. Time for the sixth launch arrived with one final member to be flown, and wall-to-wall rain about three miles away to the west. So we achieved a quick turnaround followed by a hangar landing just as the rain arrived. Back in the clubhouse we found Alan Holland continuing with his K8 fettling, while David Bourchier and John Bolt had cleared a lifetime of junk from the Technical Office cupboard. 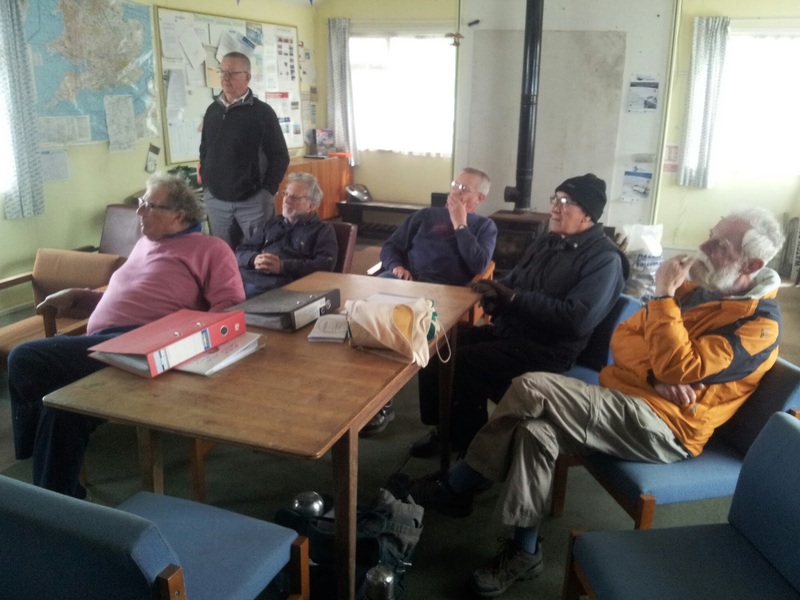 About the only planned task we failed to fulfil today was delivering a one-day-course to visitor Paul Bringel, from Plymouth, because the conditions were just too exciting. However, Steve Lewis took him under his wing; introducing him to some of the 'basics' of our sport, and then entertaining him in the simulator. We look forward to having Paul back with us once the weather improves. With yesterday having turned into a super Saturday, and regular weather forecasts overnight and Sunday first thing portending 'bright and dry' for Devon and Cornwall until late afternoon, hope was springing eternal that today would prove to be a repeat, if not even better. 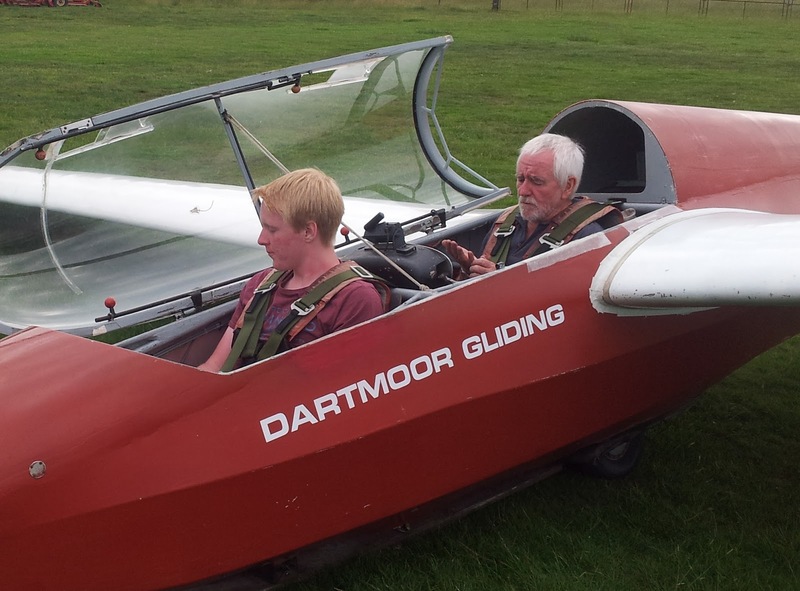 So the news on arrival at the club that the crack in trusty two-seater DMX's canopy had opened up again did nothing to daunt the spirits of the Sunday Soarers, although effecting a repair (thanks to Allan Holland) was not quick enough to prevent One Day Course student Alan Roberson from having to return to Padstow, although he is expected to rebook his course for another date in the bear future. So it was, unusually for the Sunday Service, not until after 12 before we got going - however with Junior members Henry Flowers and Luke Botham to get back in the training groove, and less junior members Jerry Wellington, Ray Swinfield and Roger Apfelsaft requiring check flights, there was plenty to be going on with. Which was just as well since the 'dry and bright' failed to materialise and the early morning overcast broke briefly into an early afternoon 'tickle' (10 mins longest flight) before deteriorating into a late afternoon overcast as we wound the altimeter sub-scales down in advance of the approaching cold front. By 5pm conditions were getting 'parky' and some pretty large drops of rain sent their message: head for the hangar! And so we did, content that 14 launches had been achieved where - were it not for Allan Holland's intervention with a roll of adhesive tape - it could have been none. Thanks also go to Henry and Luke for their retrieve and quad bike driving skills, all delivered with conscientious responsibility and without which we would have definitely struggled. And we should not forget Dave Bourchier who, in concert with Allan H, spent the day working very profitably on the K-8's airbrakes.